The Headwall of Box Canyon, Idaho. Amegaflood seems to have scoured a canyon on Earth which, interestingly, looks alot like canyons on Mars. And that new conclusion, researchers say, could helpfigure out whether there was ever life on Mars. Tobetter understand how massive canyons possibly formed on Mars, scientistsinvestigated Idaho's Box Canyon, which like many Martian gorges, was sculptedby water in volcanic rock. This deep valley ends with a round, steep wall,giving it an "amphitheater shape," and was long considered a classicexample of how a canyon formed through gradual erosion, as groundwater seepedthrough the canyon walls and wore the hard rock away. Butnow it seems a massive flash flood may actually have carved out Box Canyon roughly 45,000 years ago. By implication, many canyons on Mars that are cut involcanic rock and amphitheater-shaped like Box Canyon might have formed thesame way, the researchers said. 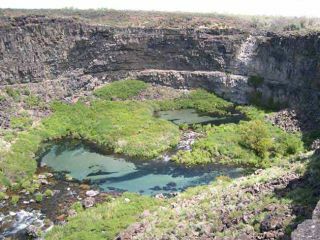 Thescientists analyzed geological features of Box Canyon, such as depressions or"plunge pools" that appear to have been the site of ancientwaterfalls, and the age of large boulders found downstream. "Wefully expected to find Box Canyon was carved by groundwater, but then all theevidence we found pointed at a megaflood," said Michael Lamb, ageomorphologist at the University of California, Berkeley. Lamband his colleagues found scour marks from flooding at the head of the canyon,and discovered that all the rock that was moved to form the gorge required avast amount of water to propel it the distance it went. Theyconclude Box Canyon was formed during acatastrophic flood or series of floods, presumably caused by melting icesheets that lay at mountains to the north. "Theentire canyon seems to have been cut out of the earth by this flood," Lambsaid. Although hardened lava, or basalt, is hard, "it's very fracturedmaterial. When lava cools, it contracts and cracks just like mud does. All thiscracking makes the basalt like a pile of stacked blocks. So while small floodsmight cause little erosion, a large enough flood can pull these blocks out ofplace." Andthe megaflood was likely very powerful indeed. "Imagine forcing a quarterof the flow in the Mississippi through a chute 32 times as narrow and 1,000times as steep as the Mississippi River channel," Lamb told SPACE.com. Conservativeestimates suggest the megaflood blasted 800 to 2,800 metric tons of water persecond, reaching speeds of up to some 22 mph within the canyon. This explainshow boulders the scientists examined could have dropped on the ground seeminglyout of nowhere ? the flood picked them up and hurled them along. All in all,the canyon could have been carved in as little as 35 to 160 days. Thecanyons of Mars may have been carved the same way ? from megafloods of waterand not, say, liquid carbon dioxide, which alsoonce flowed over the surface of the red planet. Carbon dioxide is the stuffthat puts fizz in soda. "Carbondioxide tends to erupt, be really explosive, and shoot into the air, and notform bottom-hugging flows," Lamb said. "The valleys on Mars arehundreds of kilometers long, eroded into rock, and probably required a denserfluid like water." Ifone can tell how water flowed on Mars, "that has implications on us livingon Mars and on finding out whether there was other lifeon Mars," Lamb added. Butstudying Martian canyons for signs of formation by flooding will be very hard. "Theclues of the flood event were relatively subtle at Box Canyon. It wasn't untilour second field season that we saw the scour marks at the head of thecanyon," Lamb said. "Even the highest resolution imagery from Mars,which is about three-quarters of a meter per pixel, would not reveal thosemarks. And Box Canyon formed only 45,000 years ago, while some of the canyonson Mars may have formed 3.5 billion years ago, about 100,000 times older, andthey may have altered much since then. This makes studying Earth analogues allthe more important for understanding Mars." Thefindings are detailed in the May 23 issue of the journal Science.